The Joint Commission defines a hand-off as a transfer and acceptance of patient care responsibility achieved through effective communication. 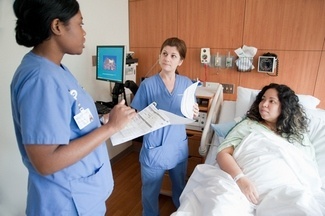 It is a real-time process of passing patient-specific information from one caregiver to another, or from one team of caregivers to another for the purpose of ensuring the continuity and safety of the patient’s care. Nurses typically take great pride and exert painstaking effort to meet patient needs and provide the best possible care. Unfortunately, too often, this diligence and attentiveness falters when the patient is handed off, or transitioned, to another health care provider for continuing care, treatment or services. A common problem regarding hand-offs is communication. Expectations can be out of balance between the sender of the information and the receiver. Please understand we know how incredibly busy you are every minute you are working. We appreciate transitioning patient information to the next caregiver is critical and that you do everything in your power to be clear and concise. These guidelines are meant to be helpful and reinforce what you most likely are already doing to keep communication transparent and smooth. The Risk Management Foundation of the Harvard Medical Institutions released a study in 2016 which estimated that communication failures in U.S. hospitals and medical practices were responsible at least in part for 30 percent of all malpractice claims, resulting in 1,744 deaths and $1.7 billion in malpractice costs over five years. Each health care setting has its own issues and challenges relating to hand-offs. The Joint Commission emphasizes the importance of health care organizations using a process that identifies causes for hand-off communication failures and barriers to improvement in each setting, and then identifies, implements, and validates solutions that improve performance. 1. Demonstrate leadership’s commitment to successful hand-offs and other aspects of a safety culture. 2. Standardize critical content to be communicated by the sender during a hand- off both verbally (preferably face to face) and in written form. Make sure to cover everything needed to safely care for the patient in a timely fashion. Standardize tools and methods (forms, templates, checklists, protocols, mnemonics, etc.) to communicate to receivers. 3. Conduct face-to-face hand-off communication and sign-outs between senders and receivers in locations free from interruptions, and include multidisciplinary team members and the patient and family, as appropriate. 4. Standardize training on how to conduct a successful hand-off from both the standpoint of the sender and receiver. 5. Use electronic health record (EHR) capabilities and other technologies — such as apps, patient portals and telehealth — to enhance hand-offs between senders and receivers. 6. Monitor the success of interventions to improve hand-off communication, and use the lessons to drive improvement. 7. Sustain and spread best practices in hand- offs, and make high-quality hand-offs a cultural priority. For more information about these tips from the Joint Commission click here. We welcome any comments you’d like to share.